Auction #1053 is Live Now! Browse & Bid on Lots Today! 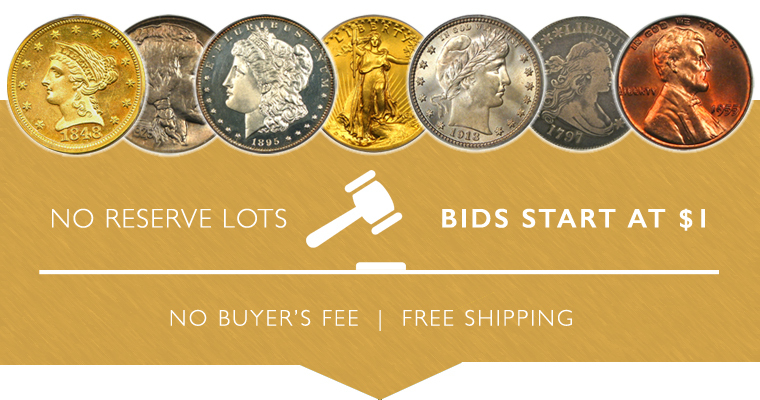 Our Sunday Internet Auction #1053 offers a fantastic selection of 450 New Items including 142 coins in the Hot Springs Gold Collection along with 150 Special No Reserve lots and 25 Vault Value items. The Hot Springs Gold Collection features numerous examples of key date pieces in the $2.5, $5, and $10 Indian sets, as well as a large variety of scarce and elusive $20 Liberty Double Eagles from the Carson City Mint. With several registry quality examples as well as dates and grades for the normal collector, there’s a wide variety of material for all types of collectors. Our first highlight is an 1854-O $3 NGC AU58. A popular and scarce New Orleans $3 gold piece. with only 24,000 coins minted. It has frosty, lustrous surfaces with nice overall eye appeal. Our second highlight coin is a 1929 $5 PCGS MS62. A key date in the Indian Half eagle series with frosty, lustrous surfaces that look like that of an MS63. The third highlight coin is a 1908 $5 NGC Proof 64. This piece is a beautiful matte proof Indian Half Eagle with brownish-bronze surfaces and absolutely glowing eye appeal. Our fourth highlight is a 1911-D $10 PCGS MS63. It is a very desirable key date with pretty yellow-gold surfaces, plenty of luster and no spots. Just 30,100 coins were struck of this issue. Our fifth highlight is a 1920-S $10 PCGS/CAC AU53. With a mintage of just 126,500, this is the second most important date in the series. Lustrous with light wear, this piece is CAC approved for quality and eye appeal. The sixth highlight coin is an 1850-O $20 NGC AU55. A scarce New Orleans-issue Double Eagle with oodles of luster. The final highlight is an 1893-CC $20 NGC MS63 ex: Battle Born Collection. A surprisingly nice mint state example of this popular and scarce Carson City issue with a mintage of just 18,402 coins. The light cleaning is really minor, and we'd like this coin in a regular holder. Of course there are many other highlights, so be sure to browse all lots in this exciting new sale before it closes on Sunday, February 24th.